A year and a half ago, I wrote about an art Internet startup company called Artsy, which used Art.SY for its domain name. At the time of my article, I asked whether a company could have success using the Syria ccTLD for its domain name and if the .SY ccTLD could become popular as a result. I just read about the apparent ongoing Internet blackout in Syria right now, and after remembering the article I wrote, I checked on Art.SY. 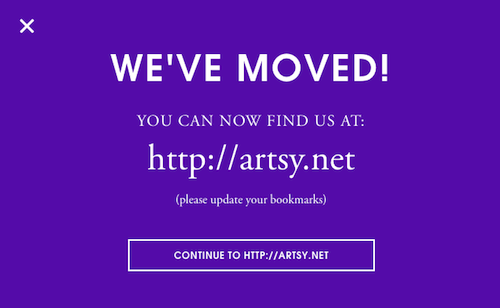 Apparently, it seems that the company has decided not to use the .SY ccTLD as its primary url any longer, and a note on the website says Artsy is now found on Artsy.net. TechCrunch reported that the company changed from .SY to .net back in January, so this apparent blackout had nothing to do with that decision. It seems that there were some technical issues that caused the change, and it’s possible the political situation in Syria had something to do with the decision as well. Interestingly, Artsy.com is a parked domain name that is listed for sale at DomainBrokers.com. I would assume the price of Artsy.com is now much higher than it would have been had the company acquired it when it was first launched. While a company’s domain name may not be as important as the product or service it offers, its success may make the most desirable domain name very expensive to acquire. Can happen to dot co,pw,pl,ng ,ws,or dot whatever. Agreed… In the case of this company, they seemed to know the risks beforehand. I would assume many companies who buy neat looking ccTLDs for domain hacks may not know the risk. and now with internet traffic in and out of syria non-existant for the last ten hours… it just goes to show. Old news, But thanks for the update. True enough, but I hadn’t read about it until yesterday. I find it interesting that the company decided to go with the .net. Yeah why didnt they purchase the .com ?